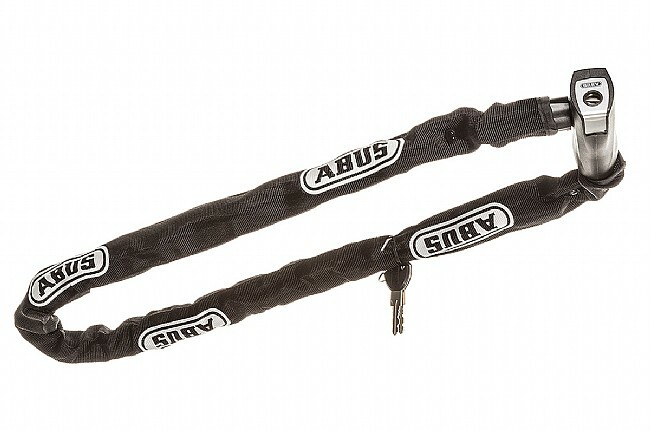 The Steel-O-Chain 880 Lock from Abus is comprised of a 7mm (0.27 in) square chain and lock, wrapped in a fabric cover to protect your bike's finish from contact with the lock. The lock and chain are made of specially hardened steel and the lock cylinder features drill protection. The flexibility of the chain means that storage is easy and it can be locked around a large variety of objects. This lock comes with two keys and is suitable for use in areas of moderate theft risk. Length: 110 cm / 3' 6". nice and beefy! Take it with you and keep those bikes locked! Bought this lock to keep bikes safe on back of car, did not disappoint. I love these chain locks as a supplement to a small u-lock. This particular one provides a lot of versatility and security. I use it around San Francisco. Of course there is no lock that is thief-proof!